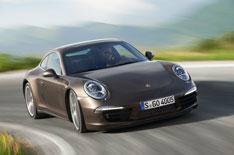 2013 Porsche 911 Carrera 4 review | What Car? The launch of the new Porsche 911 Carrera 4 and Carrera 4 S has made it even more difficult decide which 911 to go for. The fatter rump aside, Carrera 4s can be differentiated from rear-wheel-drive counterparts by a red reflective strip running between the rear light clusters. What are the 2013 Porsche Carrera 4 and Carrera 4 S like to drive? Forget talk of the new 911 not being as engaging as the previous car. It's not as raw, but in every other respect it's better, and by a big margin. The question is; are the four-wheel-drive cars better still? Well, it's worth noting that even when youre piling on the power while exiting a tight hairpin bend in the Carrera 4 or 4 S, the vast majority of drive goes through the rear wheels. It's only on really slippery surfaces that a significant amount of extra power is diverted to the front wheels to boost traction. The exact split depends on the conditions, and it is delivered so subtly that there's zero negative effect on the car's steering. Most of the time, then, the rear- and four-wheel-drive cars feel much the same. While the old 911's front-end would meander around in high-speed corners and telegraph every bump in the road surface, none of this unruly behaviour exists in the new car. Some of this is down to the new electric steering, which dials out kickback more effectively than the old hydraulic set-up. However, it's mainly because the new 911 is longer, wider, 65kg lighter, and infinitely stiffer allowing the suspension to concentrate on gluing the car to the road. The upshot is a car that changes direction more vividly than ever, while feeling incredibly grippy and completely planted at speed. Both new models ride with fantastic fluidity, too, and little road noise seeps through to the cabin, despite the fat tyres. The engines are unchanged from the rear-wheel-drive Carreras, which means a 3.4-litre flat-six that produces 345bhp and 288lb ft of torque powers the 4, while a 3.8 with 395bhp and 325lb ft is in the more exotic S.
A seven-speed manual gearbox is standard, while Porsche's slick-shifting PDK dual-clutch 'box is available as an option. If money is no object, youll go for the faster, more powerful S, but in truth, both engines are simply sensational. Each is turbine smooth and effortlessly tractable, and each fizzes with a delicious six-cylinder rasp especially if you specify the optional sports exhaust. What are the 2013 Porsche Carrera 4 and Carrera 4 S like inside? The driving position is just about perfect; it's snug and low slung, and because visibility is so good, its a breeze to place the car on the road with pinpoint accuracy. The rear seats, on the other hand, are next to useless, so they're best used for carrying any luggage that doesn't fit in the deep locker under the bonnet. A leather interior, cruise control and full climate control are standard in both cars, but nearly everything else is an expensive extra. Four-wheel-drive traction was a welcome addition in the rather edgy previous-generation 911, especially in the wet. However, with the latest rear-wheel-drive cars offering such accomplished handling, it's now much less of an advantage. Crucially, while the basic 3.4-litre Carrera 4 starts at 77,294, you can have a hot 3.8-litre S rear-wheel-drive version for just 4k more. It's the car we'd spend our money on.